All therapies are given to complement diagnosis, advice and treatment given by your General Practitioner. Orthodox treatment should always be sought for chronic illnesses. Aromatherapy Therapeutic use of essential oils to increase sense of wellbeing, relaxation, relieve stress. Widely used in hospitals & hospices. Indian Head Massage Gentle application of selective oils using ancient Indian techniques on upper body to relieve tension in muscle and mind. Pampering! Reflexology Worked usually via the hands or feet, promoting a feeling of relaxation, calmness and aiding sleep. Very popular. 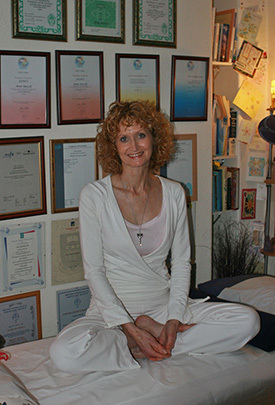 Anne can deliver a package of any of these Treatments in a single session at the same time, giving you total control of choice and understanding of her decisions. Her strong intuitions will also play a part. The aim is your fabulous and sustained improvement on whatever level you need that day.